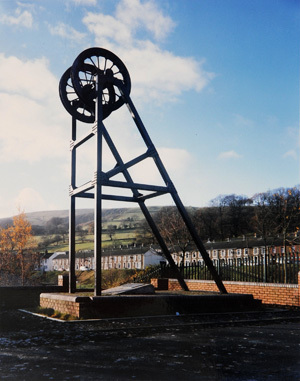 Coal tips can be considered as great symbols within the south Wales Valleys. They are varied in form and character; in the open country in the west of the former coalfield they are unobtrusive, yet in the Valleys they form prominent heaps on top of the steep sided hills. These redundant cones of colliery waste remain a prominent feature of the Valleys’ landscape; monuments to a former industry. One of the largest and most visible of these tips stands over the Rhondda Valley at Tylorstown. Resting high on the plateau, it can be seen from many places throughout the region yet is almost unseen, nothing more than an accepted part of the landscape. Some view it with grudging fondness, perhaps having played on it as a child, whilst others feel unease in its presence. Those who are old enough cannot forget Aberfan whose tip, although long-since removed, still casts its menacing shadow over the region. This dialectic makes the coal tip a fascinating cultural symbol.